Copenhagen is definitely a city you need to visit. The beautiful capital city of Denmark was named Best in Travel 2019 by the Lonely Planet travel guide. Copenhagen topped the list of major cities in the world you have to experience during 2019. Stay at one of our 10 hotels in Copenhagen and you’ll have the ideal starting point tp explore on of the best cities in the world! Copenhagen – the city that has it all! Copenhagen has it all. Get ready to fall in love with the city and its many opportunities, whether you’re young, old or in between. Discover the tortuous streets of the city centre, have a coffee with the locals at Vesterbro or have a look at Copenhagen from a bird's eye view from one of the city’s many towers. In Copenhagen, you’ll also find attractions such as Tivoli and Copenhagen Zoo, where the entire family is ensured a wonderful day. Go for a canal tour excursion and enjoy the view of buildings by the renaissance architecture side by side with new architectural wonders as The Black Diamond, The Opera House and The Playhouse. Enjoy the vibrant streets and the city that comes alive when winter turns to spring, stroll around and enjoy a coffee in the sun. Copenhagen is one of the world’s best cities to bike in. The many neighbourhoods are linked by bicycle bridges which makes it easy to pedal your way around the city and just enjoy! At our hotels in Copenhagen, you can rent bicycles and you´re ready to explore, find your favourite route and bike like a Copenhagen. All over the Copenhagen you’ll find food in world-class at all price levels. Whether you’re looking for a small, cozy café with organic food, or a sublime evening to remember at a Michelin starred restaurant, you’re sure to find it in Copenhagen. Looking for a bite to eat not too far from your comfortable bed? You´ll be sure to get an excellent meal at our hotels as well. Are you looking for shopping, Copenhagen is the place to be! All of the world’s famous fashion houses have stores in the city centre, but you’ll also find unique design shops, and of course lots of Danish and Scandinavian design. 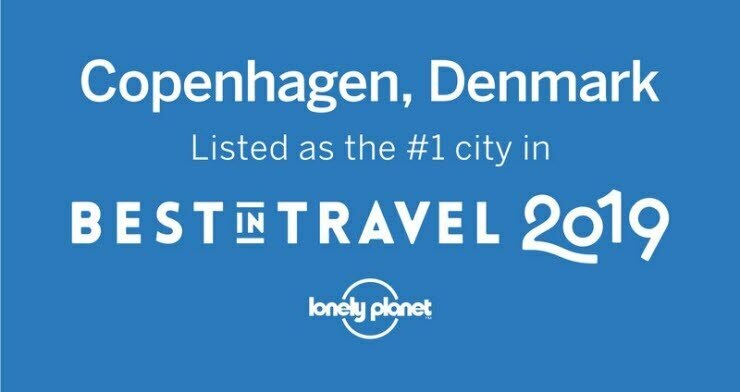 Lonely Planet - the we--reputed travel guide - has voted Copenhagen Best in Travel 2019! With that Copenhagen tops the list of cities you simply have to visit in 2019. As reasons for this leading place Lonely Planet emphasizes the unique vibe of Copenhagen, the multiple gastronomical offers, architectural marvels and great adventures for both children and adults. Stay at Scandic and you're always close to the best adventures in Denmark. We have ticket deals with sights and attractions. Copenhagen is home to many of Denmark’s most beautiful castles. Every day you can see the changing of the Queen’s Royal Life Guards in front of Amalienborg Castle, where the Queen and her family lives. Take a tour around Rosenborg Castle and experience how the sovereigns of the past lived. In the vault you can see the crown jewels, and if you visit Copenhagen in the spring, you cannot miss the many beautiful crocuses in front of Rosenborg Castle. Only 40 min. away from Copenhagen you’ll find Kronborg Castle, home to Shakespeare’s prince Hamlet. Unique city hotel in the hip Vesterbro in Copenhagen. Stay close to everything that the city has to offer. Tivoli Gardens and Copenhagen Central Station are just a few minutes away. Stay with hotel guests from all over the world at our international hotel with views of Rådhuspladsen (the City Hall Square). Here you will meet exclusive surroundings and history in one place! Stay in a newly refurbished hotel in the heart of Copenhagen’s Frederiksberg district. You’ll find culture, cuisine and star-studded accommodation all in one place. Stay centrally in a hotel with impressive views of the Lakes and Copenhagen skyline. An exceptional conference hotel – also with an underground car park. Stay in a place where luxury and comfort are paramount – close to Nyhavn harbour, Amalienborg palace, the Royal Danish Playhouse and shopping. Enjoy the view and relax with a drink in our bar. Stay just 10 km from Copenhagen Airport and 3 km from the city centre. We have free parking and modern conference rooms that can accommodate up to 275 persons. Modern hotel close to Copenhagen city centre. We have a large conference department, free parking and a hot tub with views of the marina. Enjoy excellent accommodation just 8 km from Copenhagen and gain many benefits that you can rarely enjoy when you live so close to the big city - such as a pool and free parking. Stay just 10 kilometres from the centre of Copenhagen, with easy access to the E55 motorway and free parking. We have large, modern and flexible conference facilities. A hotel in the centre of cosy Lyngby, just 13 km from Copenhagen. Lyngby shopping centre is just a lift ride away. Large underground parking facility below our hotel.